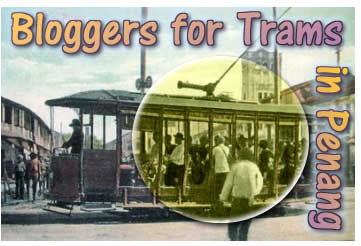 Penangites Want The Trams Back! Trams used to be a common sight in Penang in the earlier years. However they were later dismantled as cars and buses took over as a faster mode of transport. I personally find trams very intriguing and unique, as they bring a new dimension to the transportation system. While we were holidaying in Melbourne, the tram was our means of transport. We find it very convenient. There were less traffic congestion and air pollution. We took the photo of this beautiful maroon antique tram and the colourful modern ones in the town centre. As a Penang based blogger, we should try informing everyone and pass the word around about this campaign. Hopefully we get to see the tram service running again, coupled with a well planned bus network system in the near future. Georgetown would definitely be livelier with the presence of the trams. Do share your views on this matter with me. 6 Responses to "Penangites Want The Trams Back!" Good idea, but logistically with the present situation will be a nightmare. In the good old days there were a lot less cars. Nowadays, cars are congesting the whole Georgetown, not to mention the bad driving habits and manners of many drivers. I’m sure they’ll cut in front of the Trams to get ahead and cause trams to get stuck in their tracks causing more traffic woes. It’s only feasible if cars are not allowed on roads where trams run. One other obvious reason the roads in G’town are too narrow to accommodate trams, public/private/tour/school/factory buses, cars, motorbikes and bicycles…and pedestrians. Penang would be a better place if there is a revamp of the transportation system. The heavy traffic and bottlenecks at some parts of the island is really a nightmare. Trams is a good idea but will only be applicable to certain places. Thank you for your e-mail. We are glad and happy to know that somethings are being done to bring the tram back to its glory in Penang. Through this comment of yours, we know that you trying your utmost effort to make it successful. A big thank you from all Penangites.